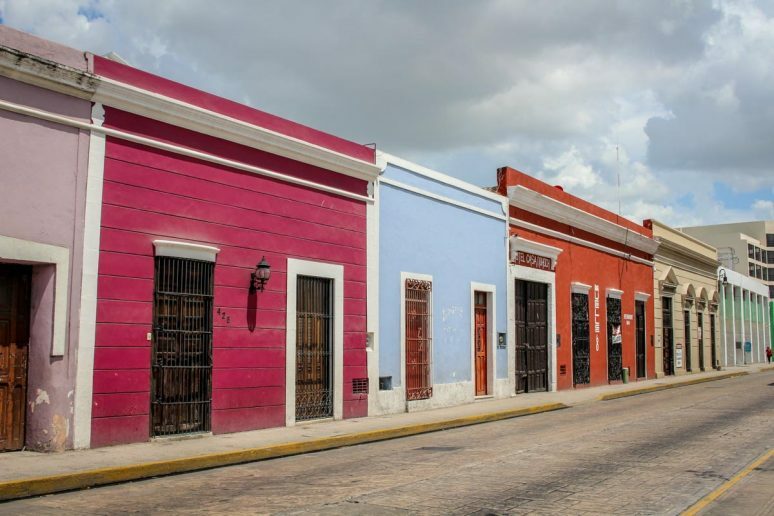 While most beach-lovers head to the Mayan Riviera destinations of Cancún or Tulum, more intrepid travelers head for the magical city of Mérida, at the heart of the state of Yucatán, Mexico. Even fewer dare to tackle Mérida’s high summer temps that require long siestas in breezy hammocks. 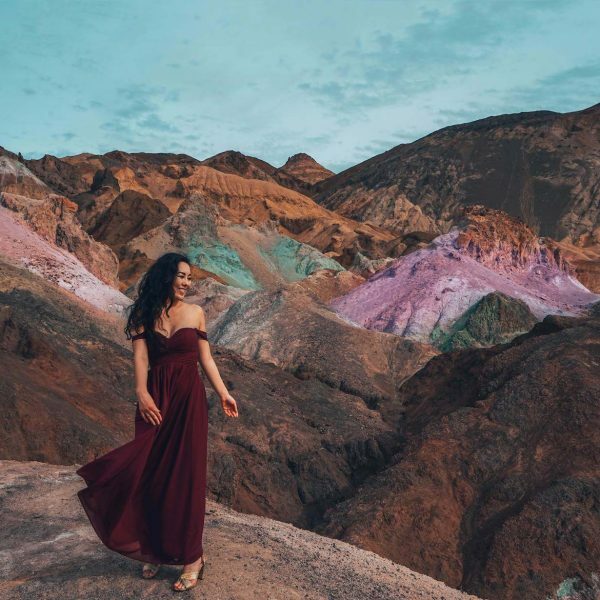 But if you want to immerse yourself in the colorful culture and mix effortlessly with the locals, Merida’s summer “off season” is an authentic and vibrant travel experience. 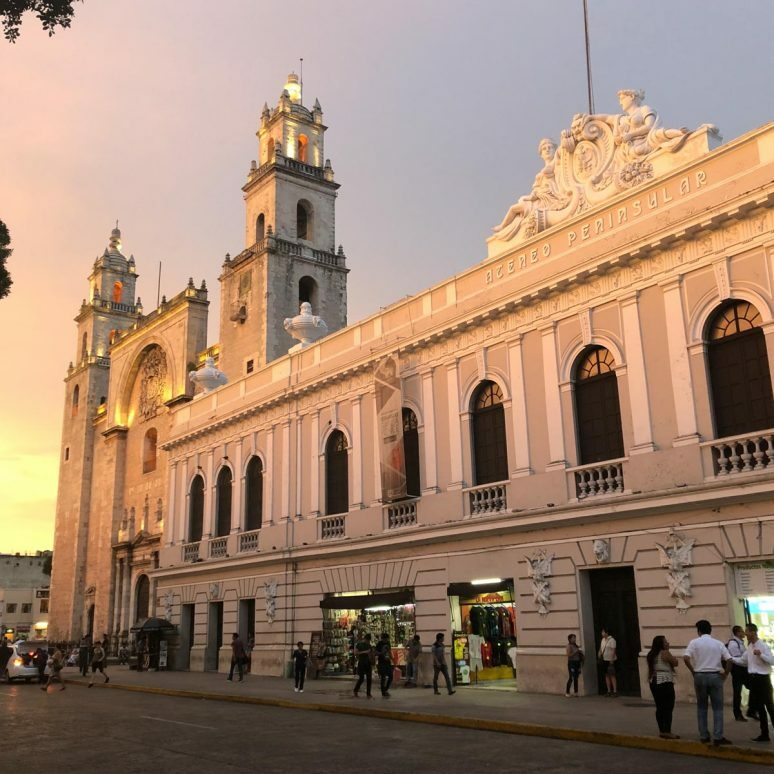 Mérida is a colonial city, with architectural treasures like the Catedral de San Ildefonso which is one of the oldest structures in the Americas. Surrounding it in the Plaza Grande are colonnades and palms, museums and cafes, horse-drawn carriages and even free wi-fi! Every cobblestone “calle” in the urban grid is lined with shops and houses painted in brilliant Caribbean colors. Behind the modest flat facades are surprisingly glamorous courtyards and gardens. Part of the fun of roaming downtown is peeking behind imposing wooden doors to discover art studios or residences or even abandoned mansions. 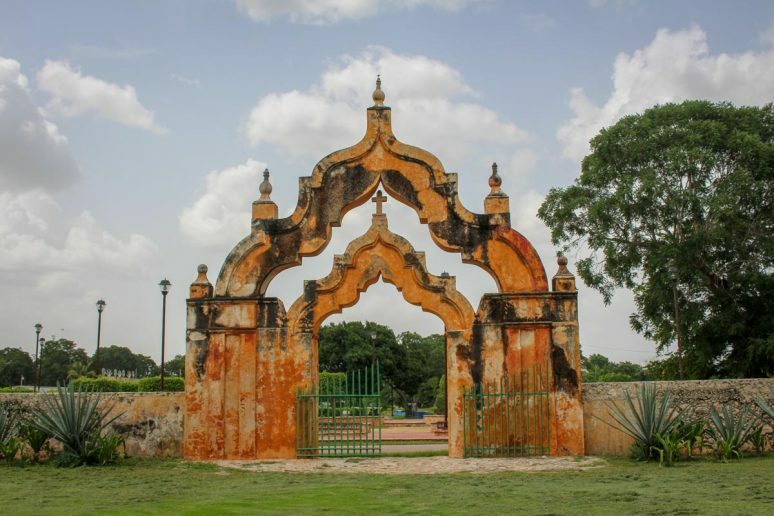 Like plantations in the American South, haciendas were the Spanish estates that served as centers of agriculture during a time of prosperity in the Yucatán. Most Yucatecan haciendas in the 19th Century produced rope from henequén, a variety of the agave cactus. The owners of these estates grew wealthy and furnished their homes with European art and furniture. Some haciendas still remain in the family, but others have been abandoned or renovated and turned into elegant resorts. Many of these haciendas are open for visitors. My favorite stop was the partially restored Hacienda Yaxcopoil which dates back to the 17th Century. The name means “the place of the green alamo trees” in Mayan, and the gardens are just as fragrant and romantic as they are green. The entire setting is frozen in time, and you’ll feel as though you have stepped into the past while wandering the grounds of this beautiful hacienda. Many of the restored haciendas now have restaurants. We enjoyed a buffet of traditional Yucatán dishes like papadzules and poc chuc at Hacienda Selva Maya after strolling through the beautiful city of Valladolid. Swimming in a cenote is a quintessential Yucatán experience that will make you feel like you’ve been transported to a different world. 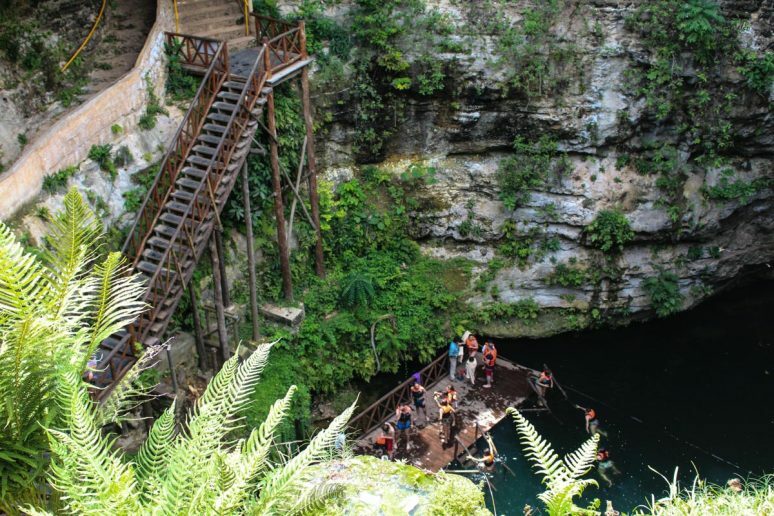 Along with a beautiful hacienda, Selva Maya is also home to one of the area’s many cenotes. Cenotes, pronounced cey-NO-tays, are sinkholes that reveal underground pools. Selva Maya’s cenote features a gorgeous waterfall and leafy jungle wall of tropical plants, and is a dreamy place to stop for a swim. Wherever you decide to take a dip, be sure to bring along a camera to take some photos of the stunning scenery! 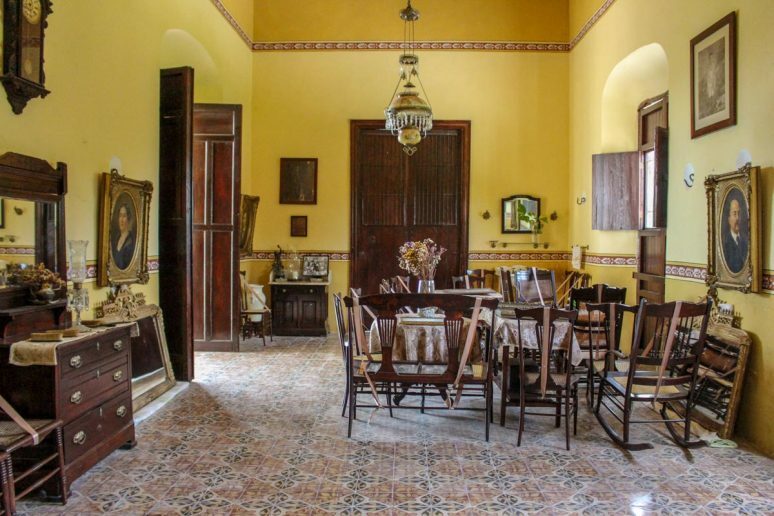 It is essential to stay in a renovated colonial home while in Mérida. There are several Airbnb properties and other rental companies that will allow you to find the ideal Spanish colonial home-away-from-home. A very special feature of Mérida living is the “pasta tile” floors in every room, named for the cement paste from which the tiles are made rather than for an Italian dinner item. Originally brought from Spain, these intricately designed tiles are now made in Mexico and are the signature look in the Yucatán. If you are a design geek like me, you’ll be truly inspired by the beautiful variety and craftsmanship. Visit Mosaicos Peninsular to see an amazing selection of patterns and you might catch them in the complex process of making them. If you’re short for time, you can watch this YouTube video to get a glimpse of the impressive skill that goes into creating each individual tile. 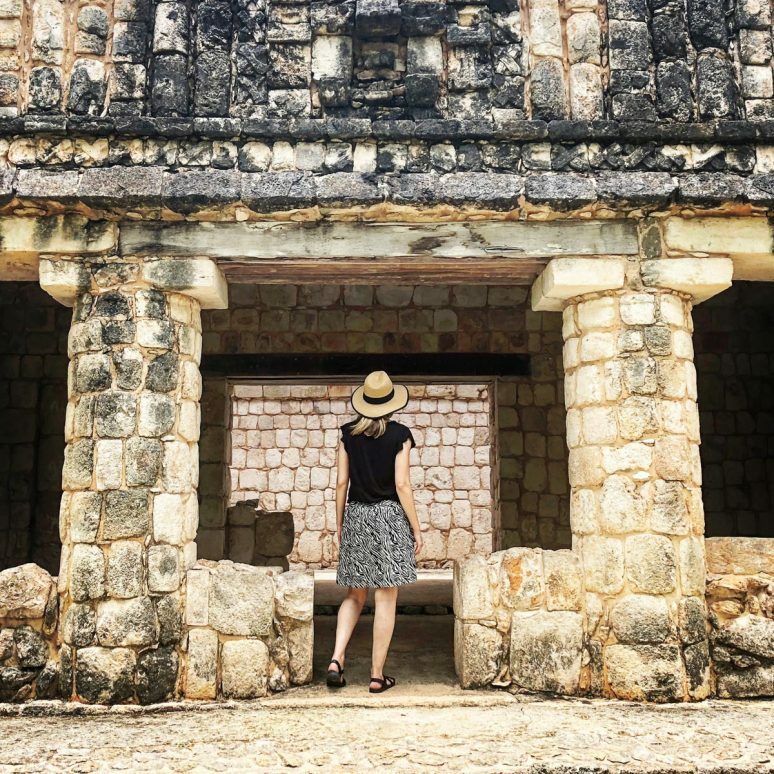 If you want to go further back in time, the Mayan Ruta Puuc is a network of roads traversing through small towns and past cultural sites and abandoned haciendas. One site worth visiting along the Ruta is called Uxmal. Many claim that the Mayan ruins of Uxmal are even more spectacular than Chichén Itzá. 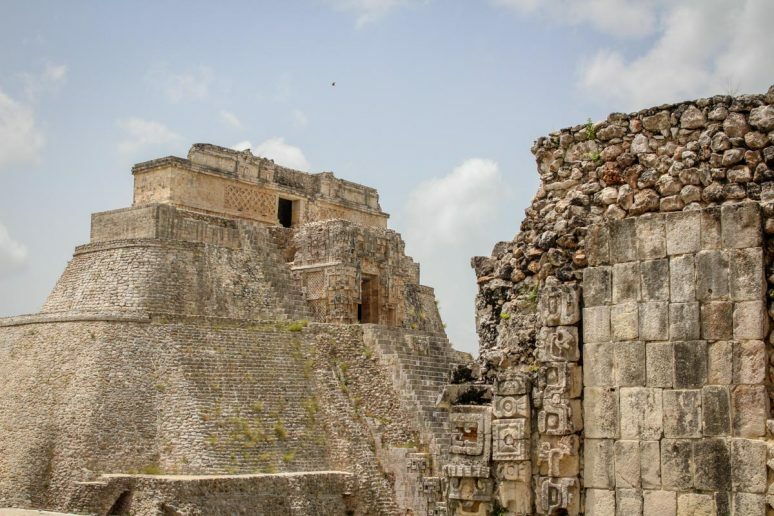 As an added benefit, Uxmal isn’t overrun with visitors blocking your epic temple photos. At Uxmal, you can still climb most of the temples for exhilarating views of the jungle below. The decorative friezes along the “Governor’s Palace” are in incredible condition and demonstrate how Mexican design, as we know it today, owes a lot to the artists of these Mayan masterpieces. During the scorching hot days, one of the best places to be is inside one of Mérida’s air conditioned cultural institutions. El Museo Casa Montejo is right on the central plaza and dates back to 1549. 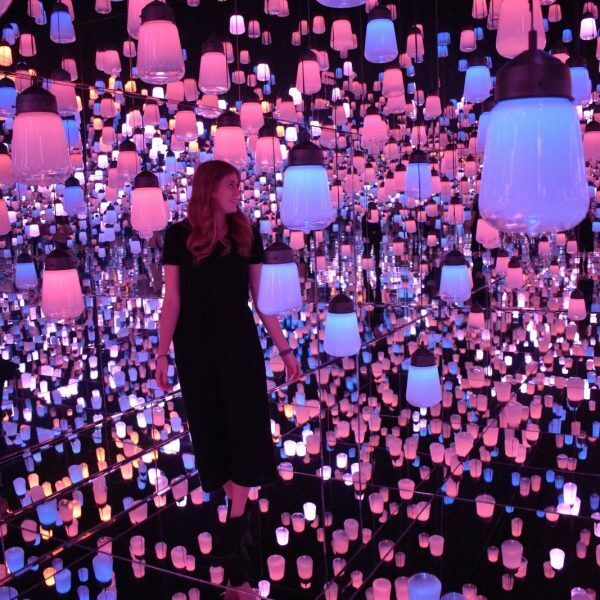 Here you’ll be able to explore the original home of Spanish conquistador Francisco de Montejo and view the contemporary art exhibitions in the newer part of the museum. One of the highlights of our time at the museum was discovering the images of celebrated Mexican photographer Flor Garduño. 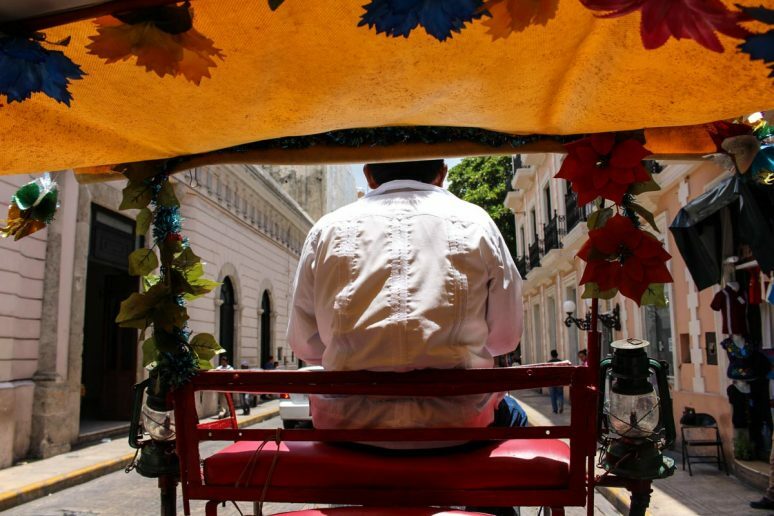 Another “cool” way to see downtown is to book a quick carriage ride up Paseo de Montejo (the same Montejo from earlier). Inspired by wide French boulevards, this avenue is lined with trees and beautiful mansions built in the late 19th Century. Our carriage driver dropped us at the original home of Yucatán’s mayor which is now the Museum of Anthropology: the Palacio Canton. In addition to their impressive collection of Mayan artifacts, there was an exhibition exploring the influence and power of women in Yucatánian history. 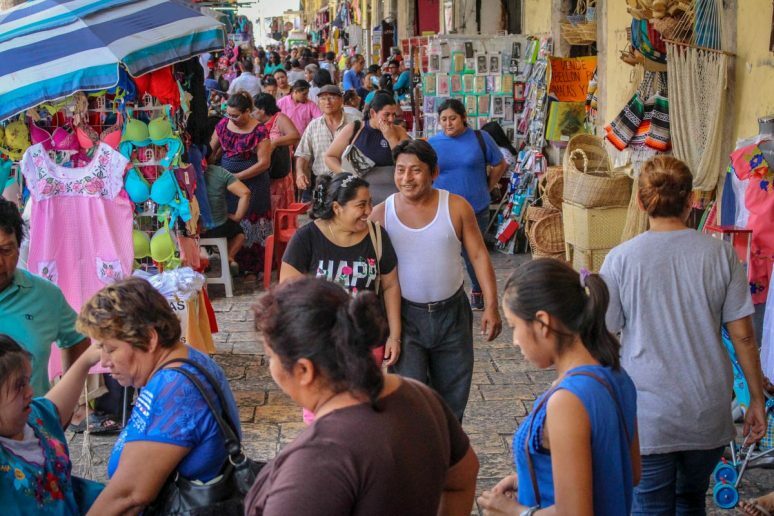 For more excitement and color, check out the Mercado de Lucas Galvez just south of the Plaza Grande. 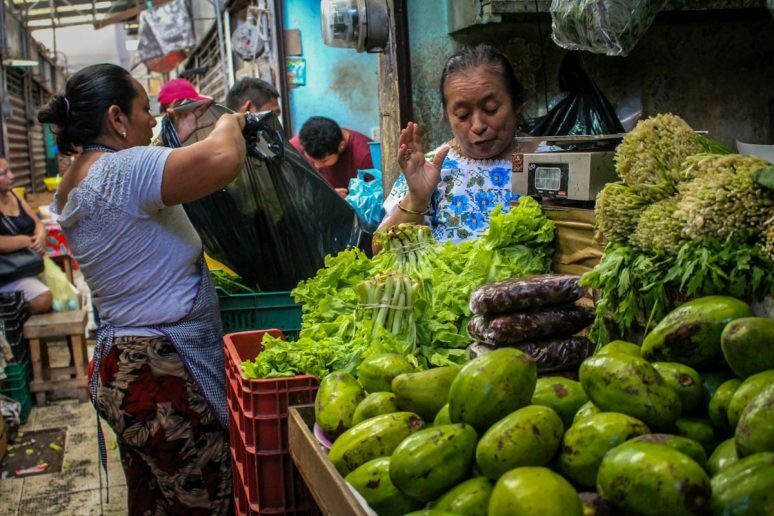 This is the real deal, where Mérida’s citizens shop for fruits and vegetables, flowers, meat, clothes, candles, and more. It was absolutely packed on a Saturday, so if you like to people-watch, grab a bench and soak it all in. Be sure to try some of the exotic looking produce or sample sweet pastries like pan dulce! Dining in the city of Mérida is impressive. Following recommendations from our hosts, we were wowed by Apoala and Oliva Enoteca with fresh and thoughtfully-combined ingredients. Oliva’s chef Stefano Marcelletti has created an overall delicious menu, including the best cannoli I’ve ever tasted. If you ever tire of Mexican food, you can find almost any cuisine you crave in Mérida. Mercado 60, just north of Santa Lucia Park, is a colorful outdoor market with 18 international food booths and live music most nights. Nightlife is everywhere in Mérida and involves every generation. During the summer, citizens delay dinner until as late as 10pm, choosing to spend early evenings in air-conditioned movie theaters, bars and public squares. 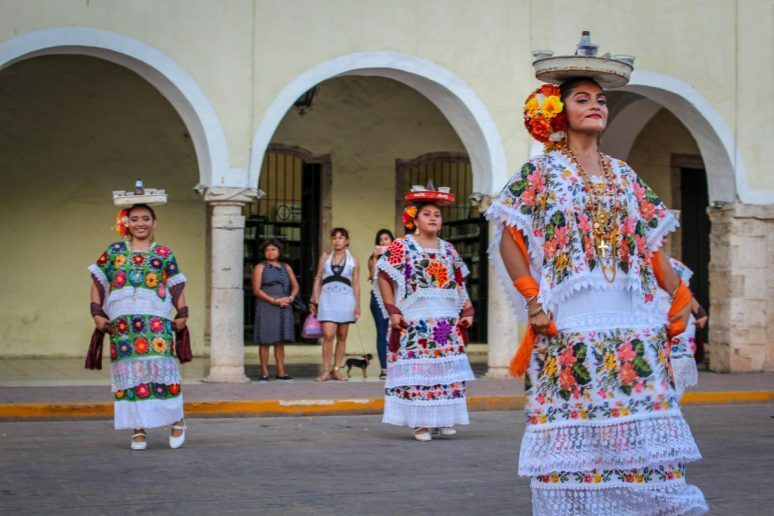 Women in traditional huipil dresses, men in Panama hats, and even teenagers in jeans gather in the parks in the evenings to cool off and enjoy free events. Each day of the week a different neighborhood hosts performances that bring locals and visitors together. Some of my most heartwarming memories of Mérida were these glimpses into local life – families dancing and clapping and laughing together. A perfect way to wind down after a day touring Mérida is to head to the cantinas for drinks. La Pulquerida “Cantina Latina” is a popular place near barrio Santiago packed with well-dressed and energetic youth. A classic hangout spot is La Negrita Cantina on Calle 60 which has been around since 1918. The artisan craft brew movement is also taking over the city at places like Hermana Republica where you’ll find a trendy vibe and photo-worthy deconstructed courtyard. If you head to Mérida in the summer, prepare for the heat, but also prepare to have your heart stolen. 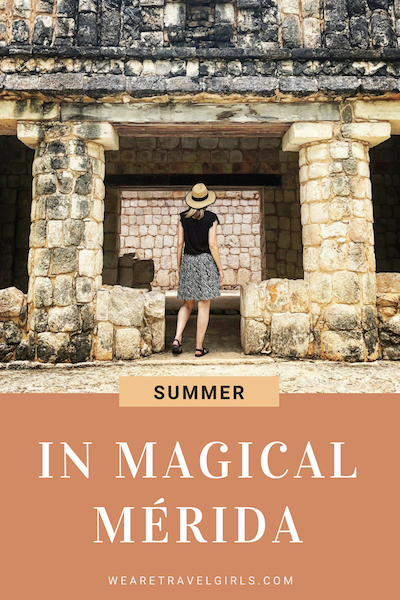 The awe-inspiring architecture and design, the sophisticated food, the ancient and colonial context, and the incredibly friendly citizens of Mérida will make it hard to leave, and will make you glad you chose to get an authentic Yucatán summer experience. We hope that this article has inspired you to spend your summer in Mérida. 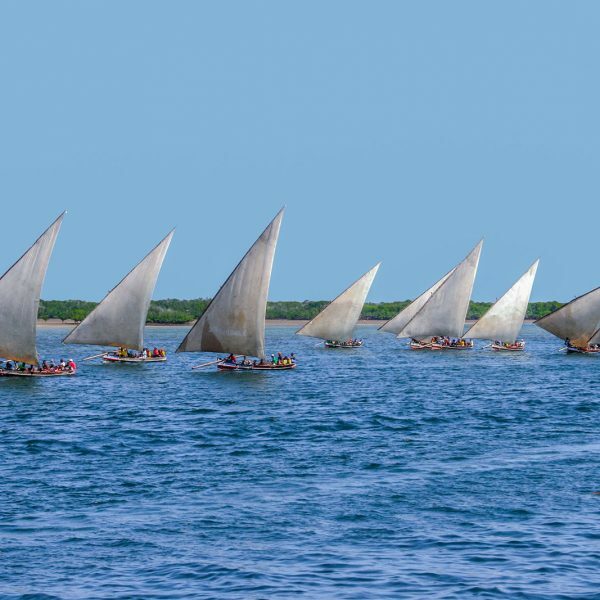 If you have any questions about the destination please leave these in the comments below. Congrats. I like this post. i went to Merida Last year. i was traveling all around Mexico. and i loved it there. though it was a little too touristy. the Spanish style was beautiful to walk around. did you find it a little dodgy at times? I have a vlog on my channel which you could probably find under my name.